Of all the shooting sports, 3gun requires a lot of gear (great for a gear head like me, not great for my wallet) but it's not nessicary for anyone to run out and buy it all right away. You have to figure out what works for you, and then build up the gear slowly. Some matches and stages may require a lot of reloads, others may require vigorous movement and your gear will have to respond accordingly. 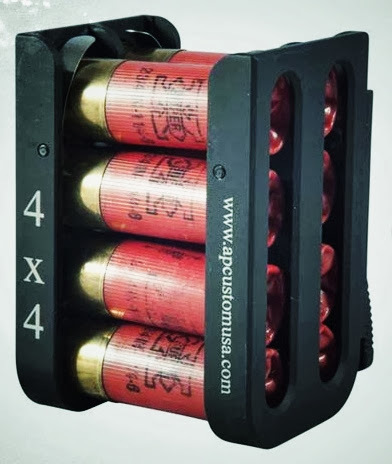 Since loading shotgun shells can be the worst time-consumer in a 3 gun stage, practicing speed loading can be very helpful. This is why Lisa Marie began my lesson with speed loading techniques. Here she is demonstrating two methods. In the video she pulls four shells from a caddy and then loads them one at a time into her shotgun. To teach me, she started with just three shells. We start with two fingers (pinky and ring finger) folded in toward my palm. These two finger slide along the outside of the caddy and then serve as a rest for the base of the shells. As each shell is pushed into the tube the thumb must be kept bent. You will almost be pushing with the tip of the thumb (any length of finger nail here, will cause an issue, so cut 'em short). This system works very well for her, but she also brought a "load 2" system, which she says is the new preferance of many 3 gun shooters. I seemed to have a better time with the second method, but quickly notice how easy it was to bump my shells out of this type of holder. Also available is a "load four" shell holder which seems like a super fast method though it seems as though one must have a lot of finger length and dexterity to make this one work. For the load 2 method Lisa Marie explained to me that one should grab two shells from their belt, working from the outside-in. Then, with the gun flipped over and held under the strong arm, the two shells follow eachother into the tube, being pushed by the thumb of the weak hand. Once again the thumb should stay bent and should be pushed with only the tip of the finger. Why are there so many different methods and shell carriers? Simply, not every 3gun stage is created equal. Some stages may require a shooting position that may not allow one to wear their gear as normal.